When you’re struggling with OCD, your experience probably falls somewhere on the spectrum from uncomfortable to terrifying. You may have bizarre or frightening thoughts. You may believe that because you had a thought, it reflects reality. Or you may have assumed that you need to act on everything that your brain tells you to do. You may have thought to yourself, I wish someone would save me from my mind! OCD makes commonplace activities an uphill climb; doing mundane things can often be paradoxically challenging for people with OCD. At its worst, OCD keeps people in a suspended in a state of electrified worry, feeling hunted by problems or threatening situations that may not even be real (that usually, overwhelmingly, are not real). OCD holds people back from living their lives. OCD has been known to ruin many a Saturday. In short, OCD is disturbing thoughts or uncomfortable physical sensations (obsessions). People with OCD often do things to try to make themselves more comfortable after they have an obsessive thought, like wash their hands or check things (compulsions). The obsession is the thought or sensation. The compulsion is the activity performed in an effort to make the obsession go away or disprove the obsession. Usually, a compulsion provides momentary relief, and then adds fuel to the fire. Obsession + compulsion= obsessive compulsive disorder. OCD is the brain’s error and danger detection center (the amygdala) sending out messages that there is a problem, when there is no problem. The amygdala is the size and shape of two almonds and is nestled deep in the core of the brain. Someone with OCD processes these error-and-danger messages and does something in response to the perception that there is danger. This creates a circuit. After someone with OCD takes action in response to the perceived threat coming from the amygdala and performs a compulsive ritual, the amygdala receives validation that there was indeed a threat, because the person with OCD did something in response to the error message. The amygdala receives confirmation that its alarm bells will be listened to and acted on, and it learns to send more of them. Brain scans of people with OCD are really interesting. The amygdala “glows” from substantially higher than average activity. The frontal lobe of the brain, which controls judgment and focus, is also substantially overactive. This is because after the amygdala sends out an error message, the frontal lobe decides there is a problem, and then devotes attention to it. People with OCD tend to focus disproportionately on perceived problems (“Did I leave a candle burning?” or “Did my boss scowl at me earlier? Oh my God, did she?”); hence, the frontal lobe also appears to glow in brain scans. 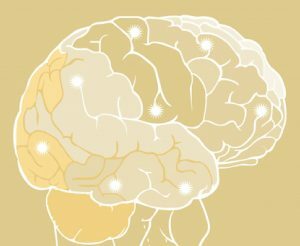 This heightened brain activity explains why some people with OCD perceive that there is conflict around them when there isn’t any; or that their world is dark, unfriendly, or even menacing. The part of the brain in charge of detecting when there is an emergency or problem is sounding, for no real reason, without warning. All those fears, phobias, aversions, and obsessions: all it is, is faulty wiring. That’s the good news: it’s just faulty wiring. 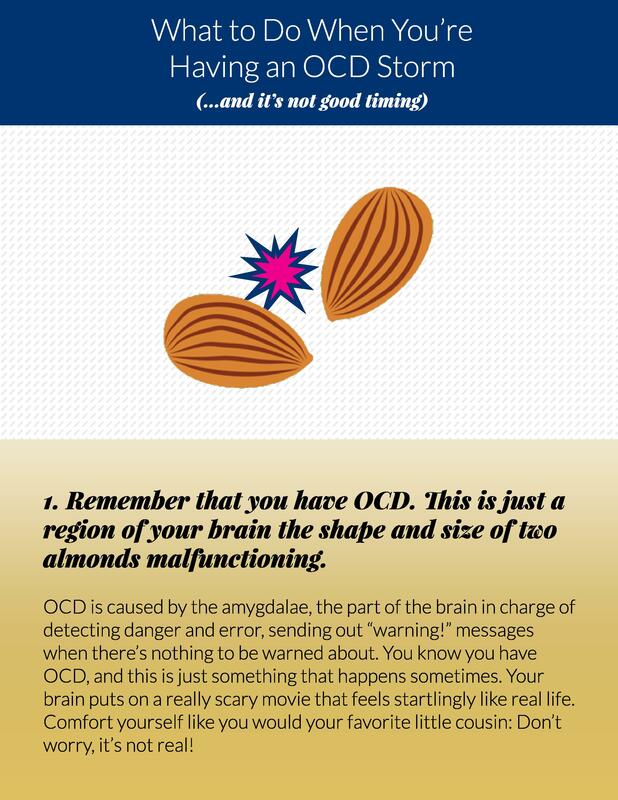 There is comfort in understanding the brain science behind OCD. If you grasp that the thoughts, fears, and physical sensations you have are just sections of your brain misbehaving, the thoughts, fears, and physical sensations you have may seem less intimidating. There’s more comforting news: you can rewire your brain. That’s how people with OCD get better. The same worry circuit that is activated when you act on an obsessive thought can be powered down by learning how to react to your thoughts and continuing to life your life, even when you feel anxious. Sound confusing? Don’t worry: read my illustrated guide on how to keep living your life when you’re experiencing an OCD storm. Or, contact me to learn more about my Glowing OCD Brain training.